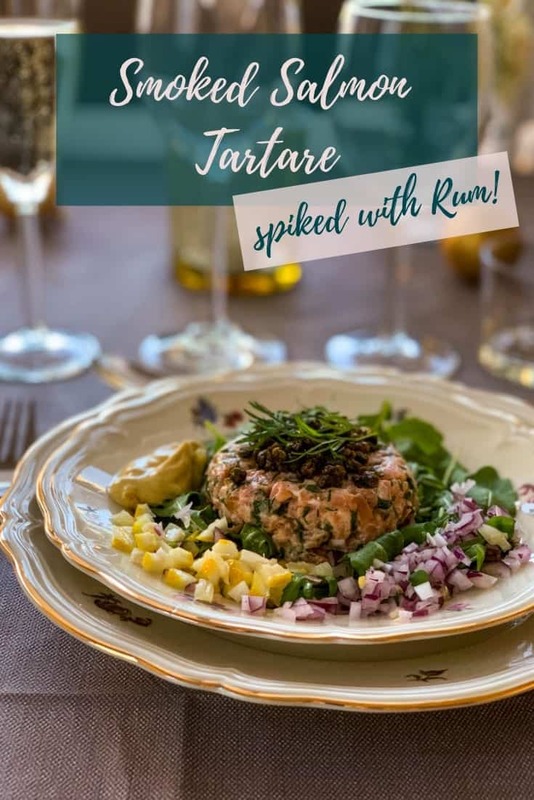 This Rum-spiked Smoked Salmon Tartare is the perfect quick & easy make ahead appetizer for New Year’s Eve, or any other dinner party. Delicious and sophisticated, it’s seasoned with spicy French Dijon mustard and a hint of rum, and topped with crispy fried capers that are sure to become you new favorite topping. Here it is! 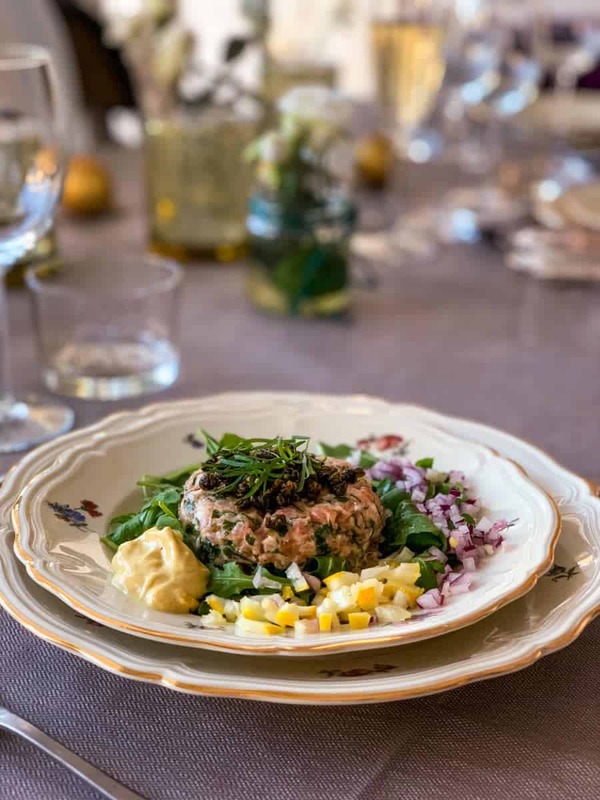 The first recipe of the 2018 always use butter New Year’s Eve menu: Rum-spiked Smoked Salmon Tartare. If you asked me to name my top three dinner party dishes, this exact smoked salmon tartare would definitely be among them. I have no idea how many times I’ve made it, but I know for a fact that it’s been a hit every single time. Its lightness makes it perfect before a heavier main course, and while seriously flavor-packed it’s super easy to make. The prep is done in 20 minutes, and you just need 5 minutes in the kitchen right before serving. If you haven’t made fried capers before, you’re certainly in for a treat. They’re the vegetarian version of crispy bacon, but better. Perfect to top a salad, canapes or say, a salmon tartare, with. Frying capers is really easy, and it takes less than 10 minutes. Start by drying the capers for a bit on a kitchen towel. Less water means less risk for oil splashing up while cooking. Meanwhile, heat olive oil in a pan over medium-high heat. When hot, test the oil by dropping in just a few capers. If the oil starts bubbling straight away, add in the rest of the capers. If not, wait another minute and try again. 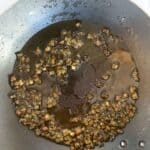 Once all the capers are in the pan, fry for 5-6 minutes while stirring occasionally. Then pick up a few capers and place them on a kitchen towel. If they crisp up quickly, they’re done, and you can remove all the capers from the pan and place on the kitchen towel. If not, cook for another minute and try again. 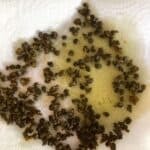 Leave the capers on the kitchen towel for at least a few minutes to let them soak up the excess oil. Or leave them there until it’s time to prep. Either way, try to not eat all of them before your guests arrive! 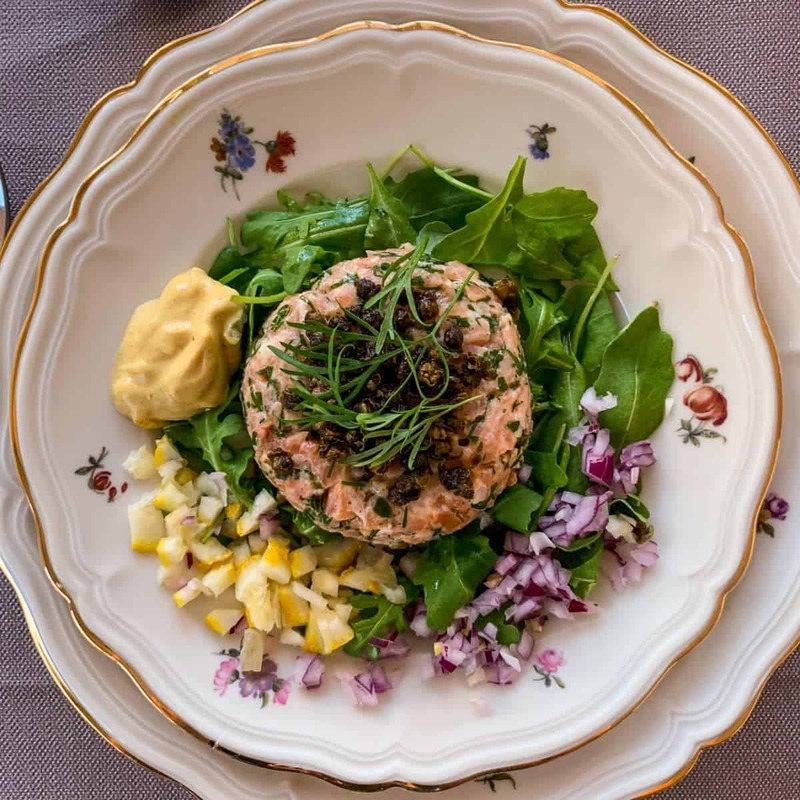 Now here is where we chop up our two types of salmon into teeny-tiny pieces, mix them together and season with rum, dijon mustard, pepper, parsley and dill. You then have the option of adding in the chopped red onion and chopped lemon. I don’t, as I like for my guests to choose how much of either they want. That’s also why I divide up my dijon mustard, placing a third in the salmon tartare mixture and the rest on the guests’ plates. You could de-construct this even more of course, but I’ve found this to be the perfect balance. 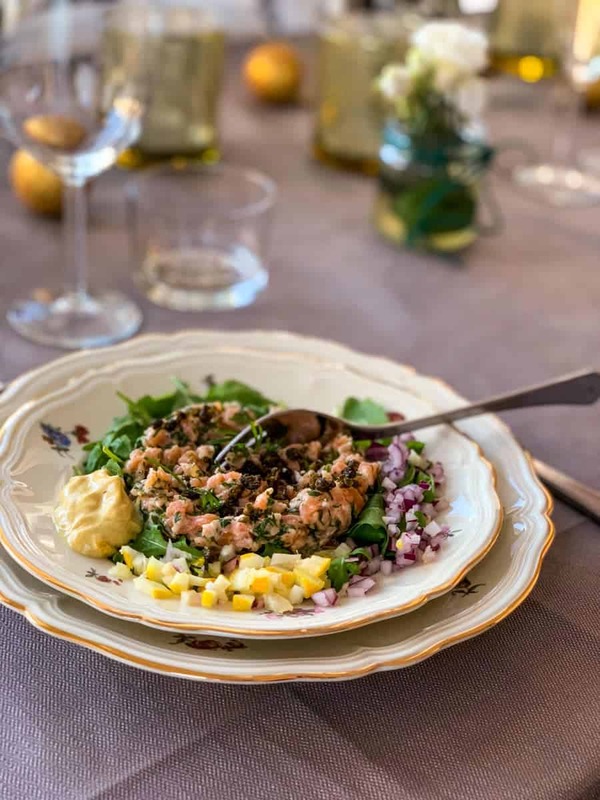 The salmon tartare is delicious even if someone abstains from mixing anything in, but you still get the fun DIY component. If you decide to instead mix it all together before serving, check the recipe notes for how much you should use. After seasoning the salmon mixture you need a bunch of small bowls or glasses, one per serving. They should be large enough to fit one serving of the salmon tartare, but preferably not much bigger. Now, in each glass or bowl, pack one portion of the tartare. The tighter you can pack it, the prettier your tartare will turn out. Then stick them in the fridge until just before it’s time to plate. The final part of step 2 is to just to get the rest of your prep done. That means finely chopping your red onion and lemon. Now I leave the skin on the lemon, as I like the hint of bitterness it provides. You can remove it, if you want to. If you keep it on though, better to go with organic lemons (no need to poison your guests with anything other than alcohol) and wash the skin thoroughly. As for the red onion, if you wish to smooth the flavor a bit and make it less sharp, place it in cold water after chopping and then strain just before plating. This step is all you need to do just before serving, or at least no more than 30 minutes before. I say – plate it, then have a drink with your guests, and then sit down to dinner. So, what I suggest to do for the plating is to start by spreading out the arugula or other leafy greens on individual plates. Then carefully get the tartare out of the container. This is not as hard as it sounds, especially not if it’s been in the fridge for a while. Just set the glass or bowl down upside down on the plate and tap the bottom firmly. If this doesn’t work, lift it up and carefully shake it a bit up and down. Just take care so that the tartare doesn’t slide out somewhere you don’t want it. You’ll hear a sound as when a vacuum is released right before it starts sliding out. When you hear this, just set it down on your plate and keep tapping the bottom until it’s released. Then come the finishing touches! Arrange your chopped red onions, chopped lemon and the remaining dijon mustard around the tartar. Top it with the fried capers and add a few sprigs of dill on top of it all, just for show. Then serve, and wait for the praise. 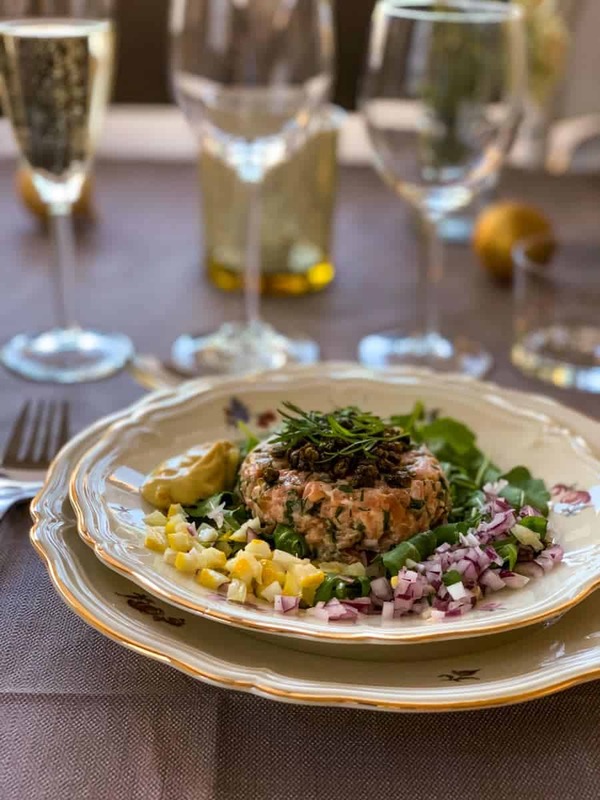 While this recipe to me is the best smoked salmon tartare there is, I do make a lot of variations with it – all depending on what salmon, spices and liqueur I have on hand at the moment. I suggest you do the same! What salmon can I use? This recipe calls for 50% smoked salmon and 50% raw, but you can go for 100% raw as well. Or 100% smoked, but then I suggest to leave the fried capers out or it risks becoming too salty. Cured salmon also works, but then you should leave out both the capers and the dill. Just a note on the fresh salmon. It’s generally recommended to freeze any salmon you are planning to consume raw for at least 48 hours, before gently thawing it in the fridge again. 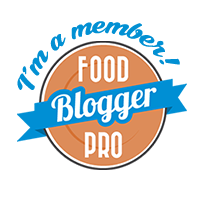 I know there are some types of salmon (like Salma and other farmed varieties) where this is not necessary, but please check to make sure what is recommended for the type of salmon you use. Do I need to use both dill and parsley? No, choose according to flavor. Use both, either, or neither. Can I use something else instead of white pepper? Black pepper works fine, but start with half the amount of the white pepper and taste to make sure it’s not too spicy before adding more. If I could get a hold of a good Blanc de Noirs (Champagne made from 100% Pinot Noir grapes) I’d definitely go with that, but since Blanc de Noir is rare to find in Sweden & my personal stash is all out my choice would be the 2012 Palmer & Co Vintage Brut (7867) instead (50/50 Pinot Noir/Chardonnay). 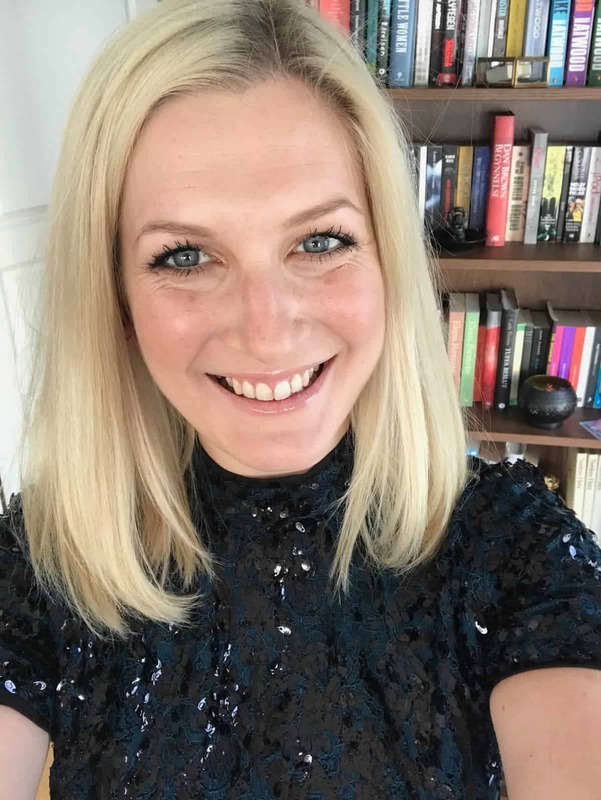 If I was saving the sparkly, I’d go for a flavorful dry white wine with high acidity, like the Leth Duett (4587), which is a mix of Grüner Veltliner & Riesling. Choosing something non-alcoholic for this dish can be difficult, as this often means going a bit sweet, and I’d prefer some acidity to complement the dish. The high acidity of a good Kombucha would sit nicely with this though, or a non-alcoholic cocktail that’s low on the sugar and heavy on the lemon juice. This could be something as simple as mixing water with a tablespoon of raw apple cider vinegar and some lemon juice. OK. That’s all for the first course of our New Year’s Eve menu. As I said, it’s easy to make & you can prep most of it well ahead of time. Also, and most importantly, it’s a really delicious killer of a dish! As always – I love hearing from you, so if you made this, please leave a comment and rating below! Or just leave a comment anyway and let me know what you think. And if you share your creation on Instagram – please tag me and use the hashtag #alwaysusebutter! Drain the capers and set them on a kitchen towel to dry for a few minutes. Heat the olive oil in a pan over medium-high heat. The oil should be a few millimeters (no more than 1/8 of an inch) high in the pan, so adjust the amount accordingly. 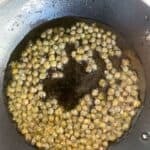 Test the heat of the oil by dropping in a few capers. If it instantly starts to bubble, add in the rest of the capers. Otherwise, wait for another minute and try again. 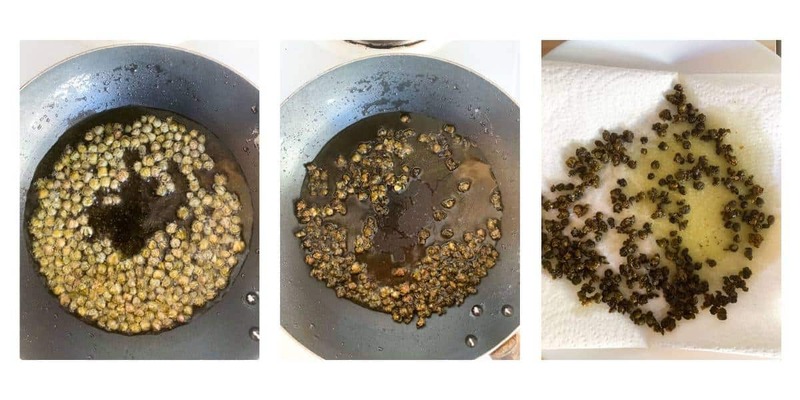 Fry the capers for 5 minutes and then remove a few and place them on a kitchen towel. If they quickly become crisp, they're ready. In that case, remove the pan from the heat and place all capers on the kitchen towel. Otherwise, let fry another minute and test again. Let the kitchen towel absorb the oil for a few minutes, or leave them there until it's time to plate. 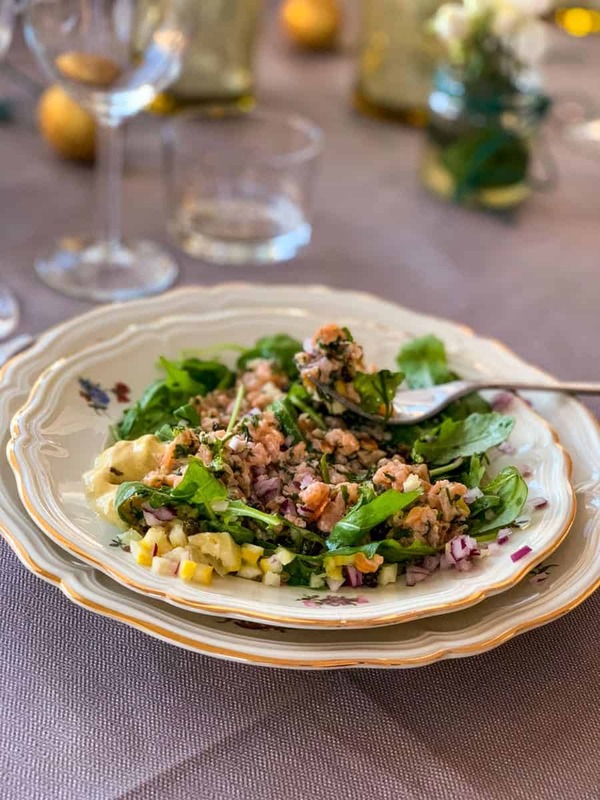 Place the two types of chopped salmon in a bowl together with 2 teaspoons of the dijon mustard, all the rum, lemon juice, dill, parsley and white pepper. Mix well, taste test and adjust seasoning according to taste. 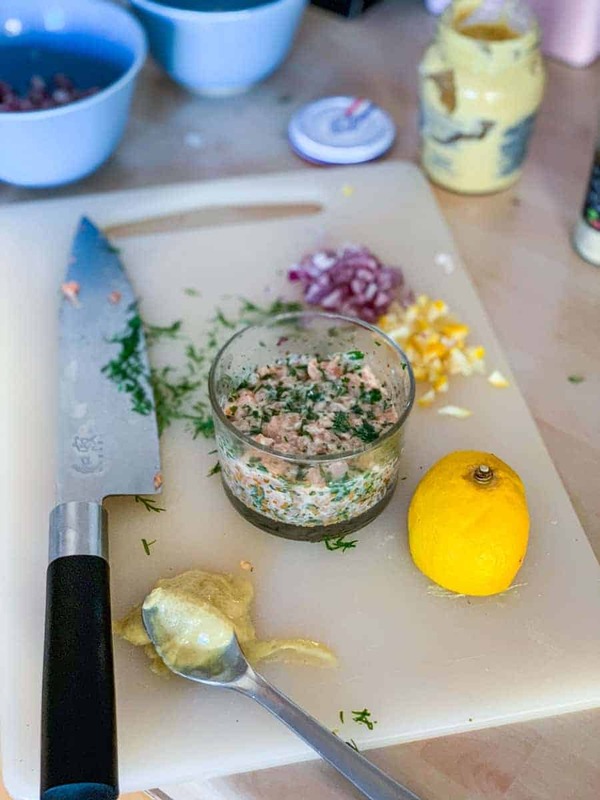 Pack the tartare into portion-sized cups and place in the refrigerator. Bring out just before plating. Make sure you've chopped your lemon and red onion so that you have them ready to go, and place the chopped red onion in cold water if you wish to smooth the flavor a bit. Bring out the salmon tartare from the fridge. On separate plates, spread out the arugula or other leafy greens. 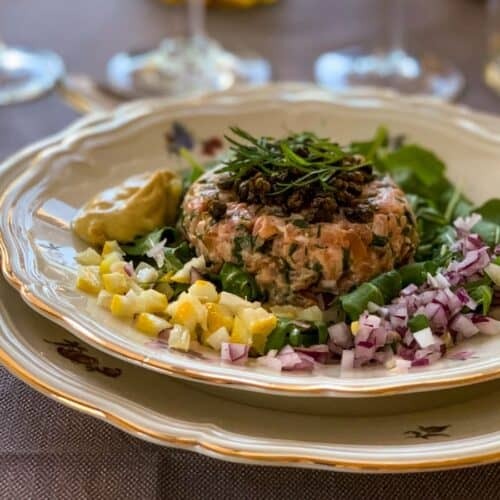 Loosen the salmon tartar from the container by turning it upside down over the plate and tapping on the bottom. If this doesn't work, shake it gently up and down until the tartar slides out. 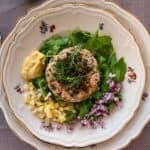 Place the chopped lemon, chopped red onion around the tartar and add about 1 tsp of dijon mustard on the side of each plate. Top with 1/2 Tbsp of fried capers and a sprig of dill. Serve! Instead of 50/50 fresh & smoked salmon, you can use all fresh or all smoked. If using all smoked salmon, the capers should be excluded or it will become too salty. If using only fresh salmon you may instead need to add a dash of salt. Taste test and adjust accordingly! You can also use cured salmon, but if so exclude the capers and the dill. Salmon that is to be eaten raw is generally recommended to be frozen for at least 48 hours before consuming. Some salmon is exempt from this recommendation but please check what applies to the kind you're using beforehand. Dill and parsley can be used both, neither, or either one on its own, depending on taste. Fried capers can be used for so much more than this dish! They're a perfect substitute for fried bacon for salads, and a great topping for a multitude of dishes. If you decide to mix in all the seasoning before serving (ie not serving with chopped onion, lemon and some dijon mustard on the side) start by mixing in 1 tsp dijon mustard, 1 Tbsp chopped onion and 1 Tbsp chopped lemon per serving, taste, and adjust the seasoning accordingly.